Toledo, Ohio - The University of Toledo football team has been here before: on the verge of going to MAC Championship playoff. The Rockets have an 8-1 record this season and have beat a ranked-opponent for the first time in nine years. Now, just one team stands in the way of a MAC playoff: Northern Illinois University. 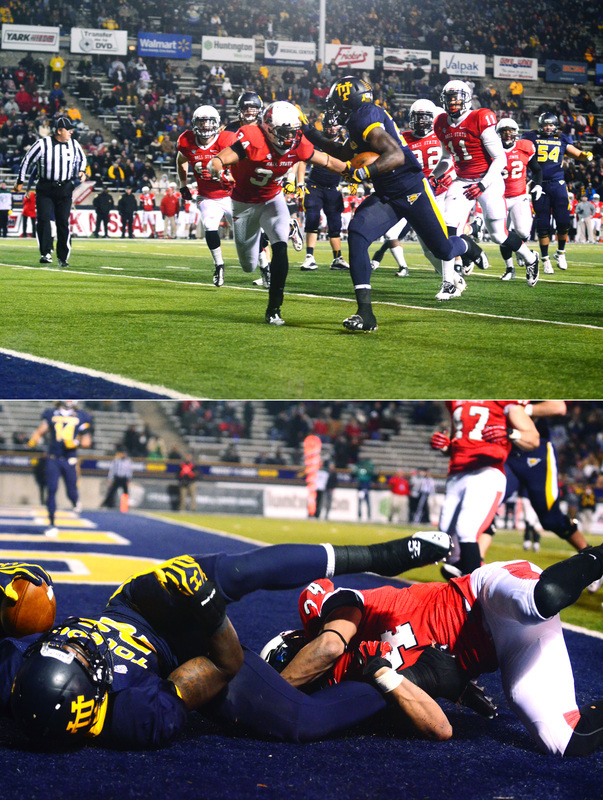 This is the 3rd straight year the Rockets road to the MAC Championship has come down to beating Northern Illinois. Ironically, that's the same team the Rockets beat in 2003 to score a win against a ranked team. 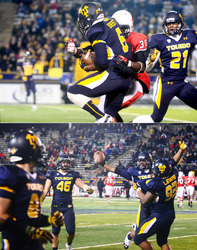 And it's the 3rd year the Rockets' road to the MAC title has come down to beating Northern Illinois. UT's Rockets take on NIU Nov. 14. Both teams come to the field ranked at the top of the MAC-West Division. The winner will proceed to the MAC Championship. Prior to last week, the Rockets were on a major winning-streak. 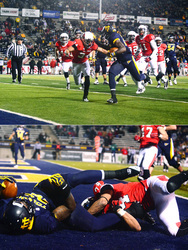 That ended Nov. 6 when MAC opponent Ball State beat the Rockets 34-27. The home game loss seemed surreal to fans and players alike. The Rockets were ranked 23rd in the nation after coming off of an eight-game winning streak. Just two weeks prior, the Rockets upset then-ranked University of Cincinnati Bearcats. This was the first season the Rockets had won eight straight games since 2001 and their first win against a ranked-team since 2003. The Rockets travel to DeKalb, Illinois to take them on Wednesday night at 9pm ET on ESPN2. Eric Page has no regrets about leaving college early to pursue an NFL career despite recent career threatening injury. 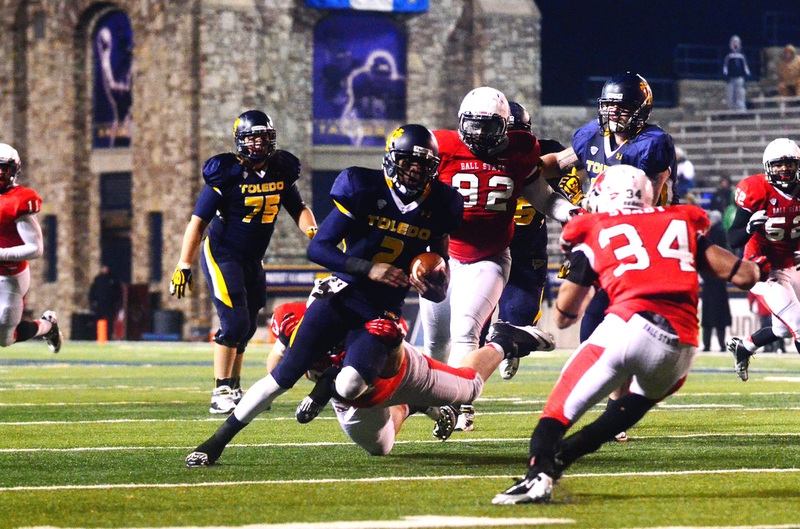 Toledo, Ohio---- Former University of Toledo receiver Eric Page is no stranger to adversity. While playing football at Springfield, Page rushed for more than 2,300 yards, scored 40-plus touchdowns and earned numerous awards including Northwest Ohio High School Player of the Year and was a first-team All-State selection. Despite that impressive record, he recalls being overlooked by bigger universities as a high school recruit because of his size. But Page went on to a great three-year career for the UT Rockets from 2009 to 2011 and last year signed with the Denver Broncos as a free agent. Just four months later, he tore his ACL and was cut from the team. Page says he has no regrets about leaving college early to pursue an NFL career, despite his recent career- threatening injury. It is that positive attitude that has carried Page throughout his career, despite the odds. His record as a UT receiver is memorable. Page managed to haul in 306 catches, breaking both the school and MAC receiving record and was only 43 receptions short of breaking the NCAA record despite him forgoing his senior season. Although he has achieved much throughout his football career, Page acknowledges he has almost always been seen as the underdog. Standing a mere 5 feet,10 inches and weighing 186 pounds soaking wet, many felt Page to be undersized for the NFL. “I think a lot of people judge me on what they see as far as height and weight and really don’t know what goes inside a guy as far as his heart and brain and his overall knowledge about the game,” Page said. Page’s decision to leave school early to pursue a career in the NFL was a decision that Page says many scrutinized from the beginning. Despite being predicted to go middle to late in the draft by many scouts, Page went undrafted. Today he is back in Toledo, going through the process of rehabilitating his knee. He remains hopeful of being picked up by another NFL team once his knee injury has healed. The University of Toledo volleyball team went 10-16 last year. Today, they have their eyes set on improvement on the court and sustained academic achievement in the classroom. Winning at home and taking care of close matches would lead to greater successes on the court, said Assistant Coach Rachel Wagener said. Senior outside hitter Sondra Parys said the key to success this year is consistency and winning all their home games. Players are ready for the challenge. “We know all their teams, how they play, we’ve beaten them, we’ve lost to them, it’s a dog fight, so we just need to keep working in the gym and get better," senior Ibero McCall Paynter said. Consistency will be key at the setting position, as a new starter takes over for the Rockets this season, junior Adria Pryor. Hitters say the transition is going smoothly. “Adria has been practicing with us for two years and we have all the confidence in the world in her,” said right-side hitter Becca Reidy. The Lady Rockets are scoring off the court as well. The team collectively earned a 3.6 spring grade point average (GPA), during the Spring 2012 semester. This was the highest collective team GPA in UT sports. Coach Wagener attributes the classroom success to the competiveness of the team and the hard work transferring into the classroom. So how will that hard work transfer onto the court? “I want to win the MAC, point blank, and I think all the girls are ready to,” Wagener said. The University of Toledo’s Women’s Cross Country team has won two straight Mid American Conference championship titles and made back-to-back NCAA championship appearances. And that just has Coach Kevin Hadsell craving more success. “Over all the years I’ve been here, we’re expected to win a MAC championship in cross country,” he said. It’s not just MAC titles anymore. Players and coaches alike are striving for a return trip to the NCAA tournament for the 2012 season. Last year, the team wrapped up the season ranked 21st in the final NCAA standings. The National Collegiate Athletic Association is the governing body of collegiate sports. “Being 100 percent honest, if we don’t go back to the NCAA’s we’re going to be very disappointed,” Hadsell said. “If we didn’t make it to the NCAA’s I would personally consider it a failure, but it would still be a good season if we won the MAC,” said Megan Wright, a red-shirt sophomore runner for the rockets and 2010 First-Team All-MAC selection in cross-country. The entire MAC conference has made the NCAA championships a combined three times. The return this year to the NCAA’s would mark the third year in a row for the Rockets, equaling the rest of the conference on their own, Hadsell said. “Our goal is top 12 in ’12,” said Wright, showing the rockets don’t only have intentions of returning to the NCAA championships but improving while there. The challenge is returning to the championships every year and not being a “one-hit wonder," Hadsell said. But the coach has another goal. “To be one of the first schools thought of when it comes to women’s cross-country,” he said.